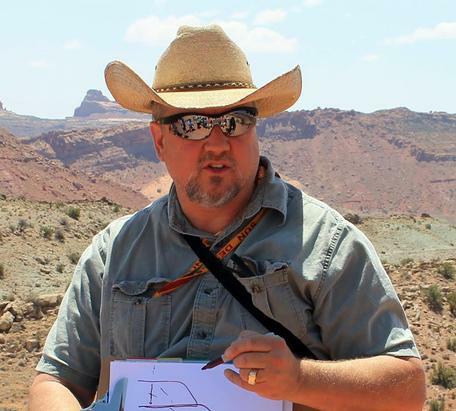 Photo of Steven Semken at Monument Valley in 2012. Steven Semken is Professor of Geology and Education in the School of Earth and Space Exploration and a Senior Sustainability Scientist in the Julie Ann Wrigley Global Institute of Sustainability, both at Arizona State University. Semken is an ethnogeologist and geoscience education researcher whose studies focus on the influences of place and culture on modes of inquiry, teaching, and learning in the Earth system sciences; and how place-based education can contribute to environmental and cultural sustainability, as well as greater equity and diversity in the geoscience community. Semken’s research is largely situated in the American Southwest, where he has worked with Native American and Hispanic/Latino/Chicano communities for three decades. He was a faculty member at the tribal college of the Navajo Nation for 15 years before joining Arizona State University. Semken earned Ph.D. and S.B. degrees from the Massachusetts Institute of Technology and a M.S. degree from the University of California, Los Angeles; and he is also a Certified Interpretive Guide. Semken served as a Past-President and Distinguished Speaker of the National Association of Geoscience Teachers, and is a Fellow of the Geological Society of America. He has been recognized with the highest awards for natural-science teaching at ASU, Diné College, and MIT. The Keyah Math Project has developed a series of versatile online activities in mathematical geoscience, using the natural and cultural landscapes of the Southwest United States as context and setting. This is an experimental psychometric instrument that measures an individual's attachment to specific or general places, by means of two dimensions: self-identification with a place, and the capacity of the place to support a person's activities or goals. The 12 items used in the PAI were devised, normed, and validated by Williams and Vaske (2003) and adapted for use in geoscience courses by Semken and Piburn (2004, 2005).